The South Korean singer's British fans raised over £600 for the endangered species, while fans from around the world raised money for other charities. The BTS army, as the group's fans are called, responded to J-Hope's call for birthday donations instead of gifts. The wildlife group Saving Scottish Red Squirrels was approached by a British university student who fundraised enough to adopt 37 red squirrels - a quarter of the total red squirrel adoptions the charity had last year. "J-Hope already knows about the red squirrel adoptions, he came across it in a Korean article," Lisa Ireland told the BBC. "J-Hope is often likened to a squirrel because he has cheeks that pop out when he eats," the 20-year-old said, after being inspired by other fans who had adopted a koala for BTS member RM for the same reason. "This is the first time there's been an adoption in the name of a celebrity and someone as big as J-Hope," said Rory Syme from the Scottish Wildlife Trust. Most people adopted one animal to mark weddings, birthdays and anniversaries, he said. "It's fantastic that fans want to celebrate J-Hope, but also support things like the Scottish Wildlife Trust." 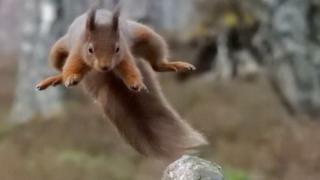 The endangered red squirrels are the UK's only native squirrel, and their continued survival has been threatened by a growing number of grey squirrels, originally from the US.